From the first moment William contacted me I could tell he truly loved this woman he was about to propose to. Read their story of his surprise proposal. See, Amanda always wanted to see Maine for it’s beauty and quaintness. Little did she know the love of her life was going to pop the question at Maine’s Great Falls Balloon festival. 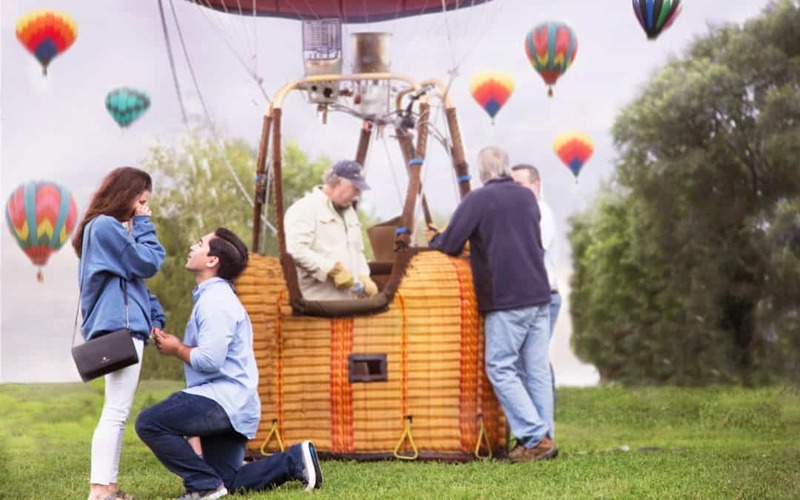 This Hot Air Balloon proposal surprise was definitely worth the trip. William planned a surprise trip to Portland to experience the city together. Upon arriving they spent their time hiking, eating at some of the best restaurants and walking along the coast. While they were experiencing the beauty of Portland, Maine I was also in contact with William to plan the best surprise proposal at the Great Falls Balloon Festival in Auburn, Maine. After planning this proposal for weeks, William decided the perfect time would be the evening however the day before plans had to change due to the “oh so wonderful Maine weather.” We decided to photograph this in the early morning instead of the evening, even with the change of plans William was ready and eager to call Amanda his fiancé. Finally came the day of the proposal. My assistant and I watched Amanda look at William with true love in her eyes. When all the hot air balloons began to rise, their balloon was the last. As they walked over to their balloon William turned and took one look at me, he looked back at Amanda and went down on one knee. Moments passed as he expressed his love for her while tears of joy filled her eyes, as he pulled out this gorgeous ring he asked her to marry him and Amanda threw herself into his arms and said YES!!! As all the beautiful balloons floated off in the distance. What a beautiful surprise proposal, engagement pictures to come. Let me document your surprise proposal. See Next – Do you really need a second photographer?